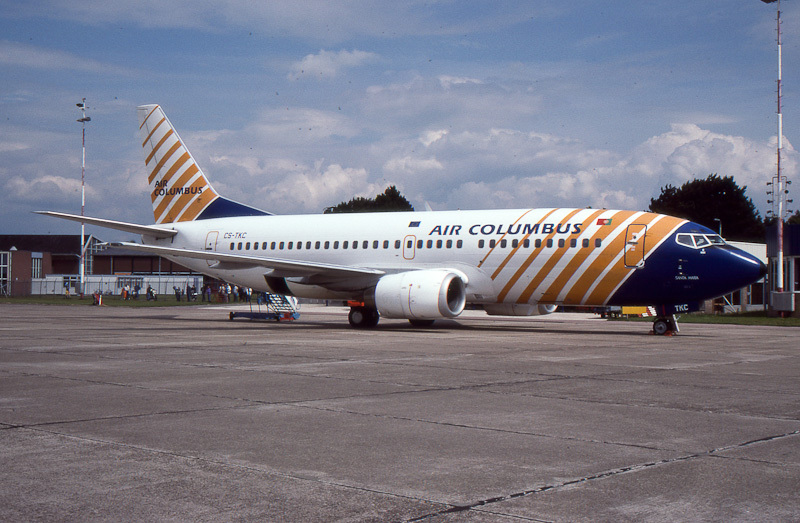 Air Columbus (BO/CNB) was one of the operators that flew the 1993 charter program at Groningen Airport Eelde in the Netherlands. Air Columbus - Transporte Aéreo Nao Regular, S.A. was formed in 1989 as a associate charter company of Sterling Airways A/S of Denmark and was based at Aeroporto do Funchal-Santa Catarina, Santa Cruz, Madeira, Portugal. Over the years Air Columbus operated a total of 9 airliners: 1 Boeing 727-270/Adv; 2 Boeing 727-2J4(RE); 4 Boeing 737-33A; 1 Boeing 737-3YO and 1 Airbus A.320-231. After Sterling Airways A/S was put into bankruptcy in September 1993, Air Columbus ran in troubles too. Air Columbus - Transporte Aéreo Nao Regular, S.A. ceased operations in December 1994 and had to end its activities in 1995. On 14 October 1987, Boeing 737-33A c/n 23830 flew first as N5573K. The airliner was original ordered by Nordstress, but sold to Norway airlines before delivery. On 21 January 1988, the airliner was delivered as LN-NOS to Norway Airlines Charter. In 1988, the LN-NOS was leased to Britannia Airways and the United Nations. In 1989, the aircraft was leased to Air Europe and registered G-BRXJ on 11 April 1989. After the Boeing was returned to Norway Airlines and registered LN-NOS on 26 April 1991, the aircraft was leased to Air Columbus and registered CS-TKC on 14 March 1992. Air Columbus named the CS-TKC "Santa Maria". After Air Columbus ceased operations in 1994 the Boeing was returned to Norway Airlines Charter. On 15 April 1995, the Boeing was registered as 9H-ACT and leased to Air Malta. On 13 November 1995, after the lease to Air Malta ended, the Boeing was leased to TAP-Air Portugal and registered CS-TIO. In June 2000, the airliner was sold to Euroatlantic Airways - Transportes Aéreos S.A., Sintra, Portugal, which company leased the Boeing as PR-BRA to BRA Brasil Rodo Aereo (Rotatur). After it was returned to Euro Atlantic Airways the aircraft was registered as CS-TLI. On 11 January 2004, the airframe was leased again to BRA Brasil Rodo Aereo and registered PR-BRY. From April-July 2004 the PR-BRY was operated on the EuroAtlantic Airways services in Europe. In July 2004, the 737 returned to BRA Brasil Rodo Aereo.